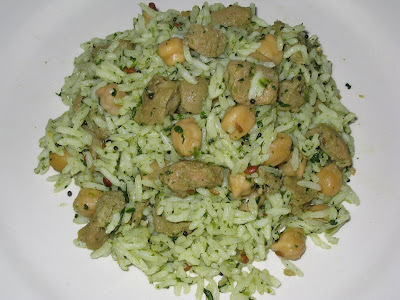 Green Rice with Chickpeas & Soya Nuggets.. While on the phone with my Mom before Diwali, I realised that I was way behind schedule for making snacks and sweets for Diwali. My mom said she had prepared only a couple of goodies as its only her and dad at home. On hearing that I really felt ashamed for not having even started with anything. 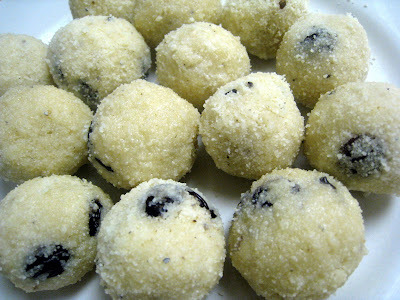 Rava laddu was one that she mentioned that she has made. On hearing that I went back memory lane and how much we love these. It was a long time since we had these, and I had never tried making them at home also. So, I quickly took down the recipe from her and finally made them for the diwali puja. 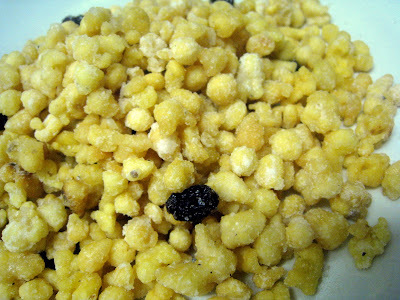 The one thing I have noticed and love about the Rava Laddus we make is the addition of Cloves/Lavang in it. Have not seen it being used so much in Rava laddu recipes and I wonder why. It gives a very nice fragrance and flavour to the laddus. Cloves/Lavang - 5, slightly crush them. I also used a little milk while binding the laddus. - Heat the ghee in a heavy bottomed pan. Add the cloves and the raisins, when they puff up, add the rava to the pan and on low flame, fry with constant stirring till a nice aroma comes from the rava. Transfer the rava to a plate. - Now add the water and sugar to the pan, stir and boil till the syrup forms to slightly sticky consistency. It took me about 7-8 minutes. - Add the cardamom powder to the syrup. Switch off the flame and now add the rava to the syrup. Mix well so that no lumps are there and the mixture is uniform. - The mixture will be very wet and sticky at this point. Cover the pan and keep aside till it becomes a little dry,i.e. for about 30 mins. - When still warm enough to handle, take little mixture at a time, and shape into laddus. - Let cool completely and then store in air-tight container. - I used a little milk on my palms while shaping the laddus. - Midway thru making the laddus, I had to slightly warm the mixture again, as it became slightly dry. Turned out ok with slight warming and with the little moisture from the milk. Firstly, Wish you all a very Happy Diwali. Hope the festival of lights brings joy, health and happiness to one and all. Now, if you have guessed from the title, yes, my intention was to make Boondi Laddus, but something went wrong somewhere and this post turns out to be just Sweet Boondis ;).. I think the sugar syrup I made was too less and moreover a little beyond the required consistency, hence couldn't bind the boondis at all. Better luck next time, but nonetheless, they tasted great, so no regrets there. It didn't take us much time to finish the whole thing all at one shot. It reminded me of the sweet boondis offered in temples. Water - 1/4 cup approx. - In a pan, take the water and sugar quantities mentioned for the syrup and boil till you get a one-string consistency. - Mix the besan with the water and form a smooth batter without any lumps. - In a kadhai, heat oil. Hold the skimmer/jharana/ladle with tiny holes that you use for deep-frying, about an inch above the hot oil, pour the besan batter on the ladle such that the batter drops down though the tiny holes of the ladle and forms boondis in oil. - Adjust the consistency of the batter if you feel that the batter is too thick or too thin to drop down. - Take out the boondis from the oil once they stop sizzling and add to hot syrup, so that they soak in the syrup. - Once all the boondis are added to the syrup, add in the cardamom powder, and the raisins and mix the boondis well so that the syrup is evenly coated on them. - Leave for about 10 mins and take them out and spread on a dry plate till they dry up. - If keeping for later, once cooled completely, store in air-tight container. - Wash the bhindi, pat completely dry. 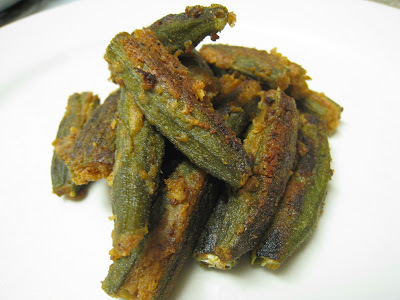 Cut the stalk portion of it and make a shallow slit lengthwise such that the bhindi still remains intact as one whole. - Mix the besan, cumin powder, coriander powder, amchur powder, chilli powder, turmeric powder & salt. - Stuff a generous amount of this mixture into the slit bhindis. Pour the lemon juice over the stuffed bhindis. - Heat a wide non-stick pan, drizzle little oil all over the pan, and place the stuffed bhindis evenly so that the bhindis are directly on the pan and not on one another. - Keep the flame on very low, cover the pan and let them cook. Keep turning the sides every once in a while to avoid them getting burnt and evely fried on all sides. - Lemon juice is optional. I did not add it this time, but the mango powder gave it a nice tang and was enough. - I usually add a little bit of garam masala powder also to the stuffing mixture. But you can leave it out and it tastes just fine too. - I like to sprinkle the leftover stuffing mixture over the bhindis in the pan so that they would get caoted with it also. 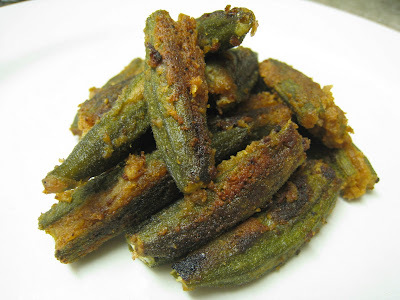 - A great way to enjoy these stuffed bhindis are to soak them for a minute in a bowl of yogurt and then have them with rotis or just like that. Thanx to chatting with a friend, I was reminded about this breakfast item which I hadn't made in a long long time. Apart from remembering the recipe, a great tip that I got from her was the addition of egg to it. 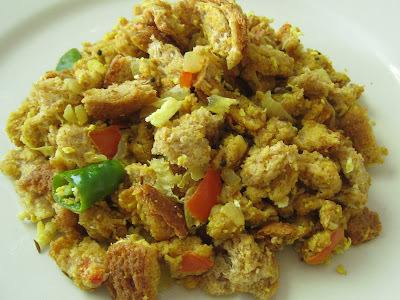 I really liked this tip and made this Bread upma with the addition of egg. So, thanx to her. - Heat little oil in a pan, add the mustard seeds, when they start cracking, add the cumin seeds, green chillies and curry leaves. - Add the onions and fry till they turn soft and transparent and then add the tomotoes and fry till soft. 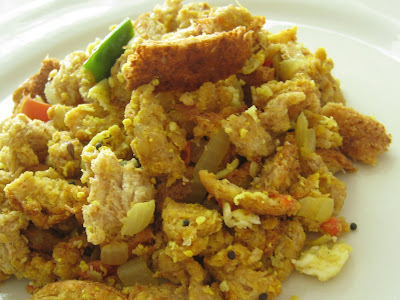 - Add in the turmeric, salt and eggs and beat till they scramble evenly. Now add the bread pieces, add the cilantro and mix everything well. Switch off heat and keep covered. Note : If you don't eat eggs, just omit the eggs and follow the rest of the procedure. This is another of my favourite curries from what my mom makes. This is a curry which is very fragrant and super delicious. We usually serve it with rice, and also idlis and rotis. Do try it and you will not be sorry. - Grind the coconut, coriander seeds, fennel seeds, cloves, cinnamon, red chillies, tamarind, turmeric powder with little water to form a fine paste. - The dal should be boiled to be very soft and mushy. - Boil the veggies with little water and salt, together or one by one till soft but not mushy. - To the pan with veggies, add the boiled dal and the ground paste, adjust salt and boil till the raw smell goes away from the masala. - Ready to serve with hot rice or idlis or rotis. Note : You can add other veggies also to this, but my mom says that the combination of green beans, potato and gherkins works best for this dish. The green rice is an inspiration from a friends recipe. I would blog about that actual recipe soon, but this is something that I adapted and made without any onions or garlic and added some soya nuggets and chickpeas to make it more filling and to save myself from making an extra side ;).. This turned out be a completely tasty one dish meal and we loved it. White Chickpeas - 1/2 cup, soaked overnite or in hot water for abt 2 hrs. - Heat abt a tsp of oil in a pan, add the cilantro leaves, ginger and green chillies and saute till the cilantro leaves wilt. Take off from flame. Once cooled, blend in a mixie to form a fine mixture. - Soak the soya nuggets in hot water for abt 5 mins, then squeeze out the water and pressure cook them with salt and about 1/4 cup water for 1 whistle. - The chickpeas have to be cooked too. So either pressure cook the soaked chickpeas with little salt till soft but not mushy or use canned ones. - Once all these are ready, in a pan, heat little oil, add the mustard seeds and udad dal. Once the mustard seeds crackle, add the cumin seeds, the ground cilantro paste and the cooked soya nuggets and the chickpeas. Add little salt and saute for about 2 mins. Switch off flame. 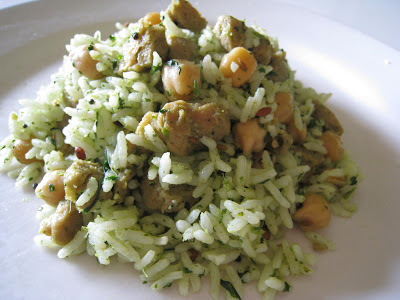 - Now, add the cooked rice, lemon juice and mix everything well so that the rice gets evenly coated with the mixture. 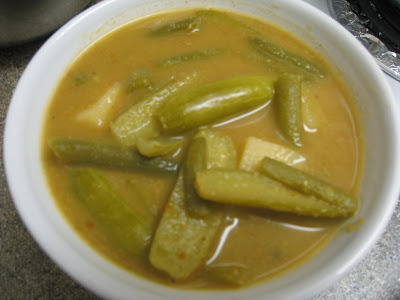 - Serve hot with yogurt and pickle or papad. - I think mint leaves would be great in this too. Just plain mint or a mixture of both mint and cilantro would taste great. - I think next time, I would increase the quantity of cilantro slightly more, just for the color, though tastewise, this was just rite and gave it the rite flavour. - Adding onions and garlic would bring about a nicer flavour to this rice, but this time I opted for not adding both. - I cut the soya nuggets into smaller pieces as the chunks are very large otherwise. - Lemon juice is optional, but I think it gives it a nice touch.